Every year I go camping with a group of friends from my daughter's primary school days. No, I'm not keen on sneezing in a field, carrying my dishes to a tap to be washed and walking in the dark of night to an outside loo in the middle of a field with scary shadows everywhere. But I am keen on my friends. So I try to go -- though sometimes, I don't sleep over because I'm not camperly like that. This year, I was just a little bit broken (ankle problems) and I couldn't chase Kathleen and Mabel round and round and round the camp as I normally do. So I persuaded them to make a story with me. Here it is, scanned from my sketchbook, complete with all the smudges. 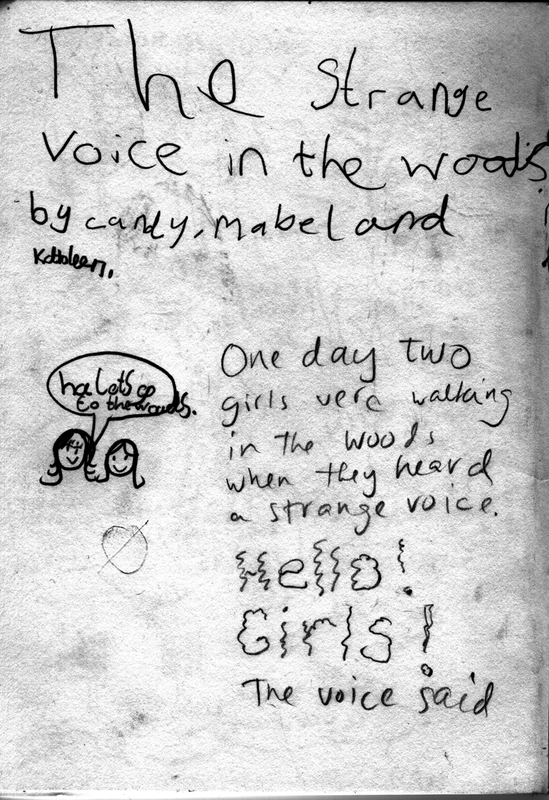 One day, two girls were walking in the woods when they heard a strange voice. "HELLO, GIRLS!" the voice said. 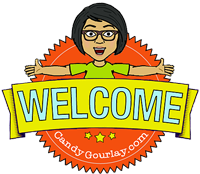 The "Hello Girls" part has to be read in a sheep like voice. Mabel did the big writing at the top but the terrible handwriting is mine. 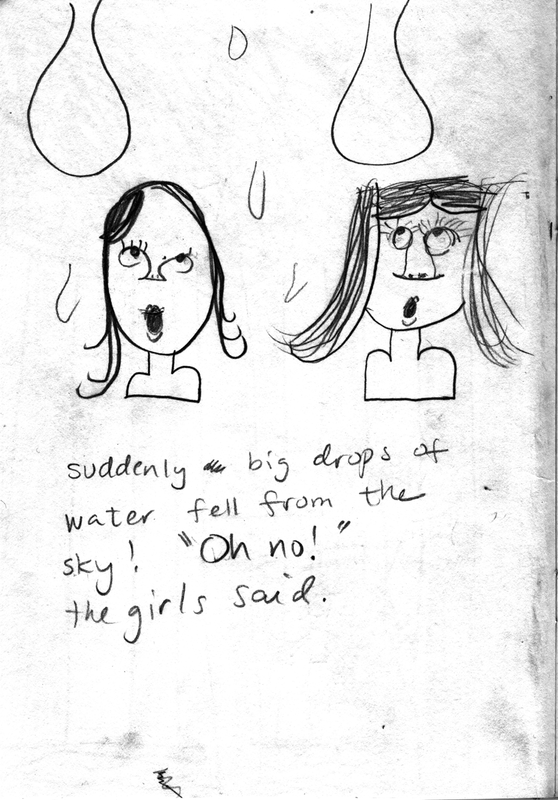 Mabel and Kathleen each drew their own girls. At this point, I just wanted to scare them with my sheep voice. 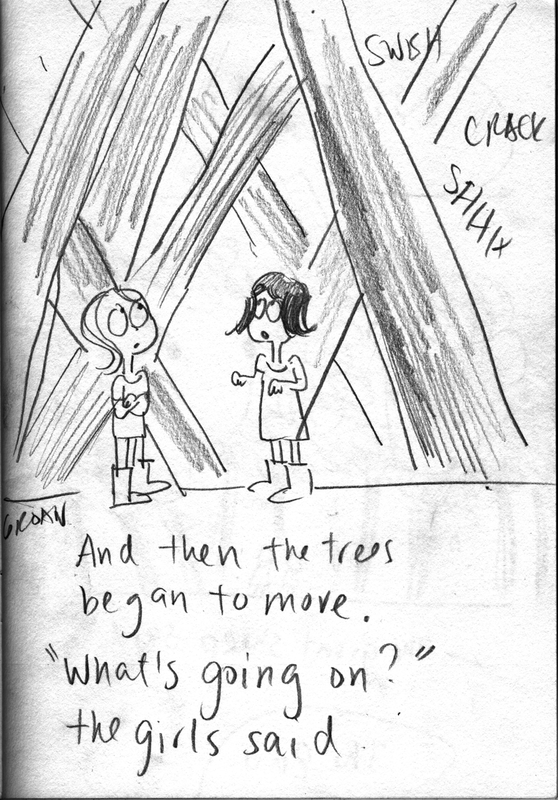 Mabel began to draw the trees, and that gave me a sneaky idea. They also drew a river, but we forgot about the river later on. Suddenly, big drops of water fell from the sky. "Oh no!" the girls said. 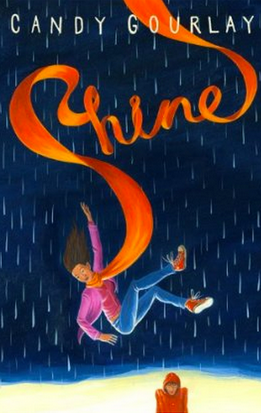 It began to rain a little bit and so we decided that big drops of water would fall from the sky. 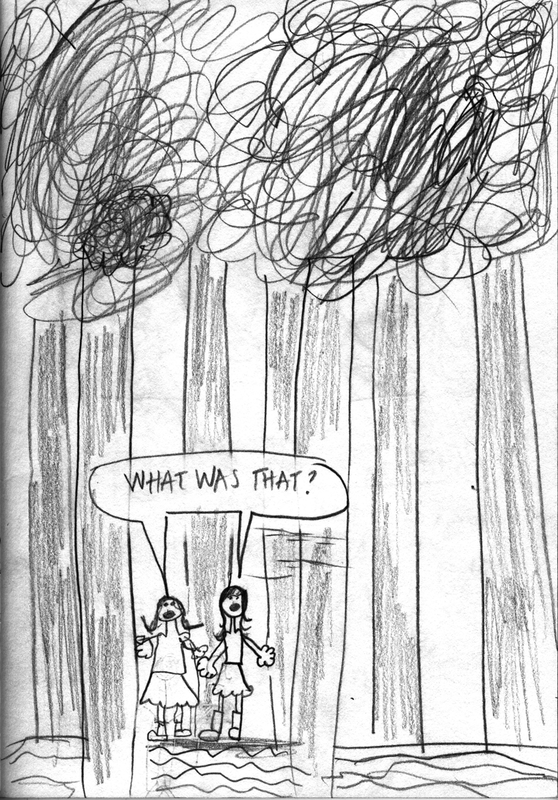 At this point our drawing was interrupted by lots of mummies and daddies returning from a walk in the woods. And then the trees began to move. "What's going on?" the girls said. I don't remember why Mabel and Kathleen disappeared. Maybe they were climbing on a dad or two or eating watermelons. But they were gone for a while so I drew the characters on this page and got the story heading for its conclusion. "NOTHING!" 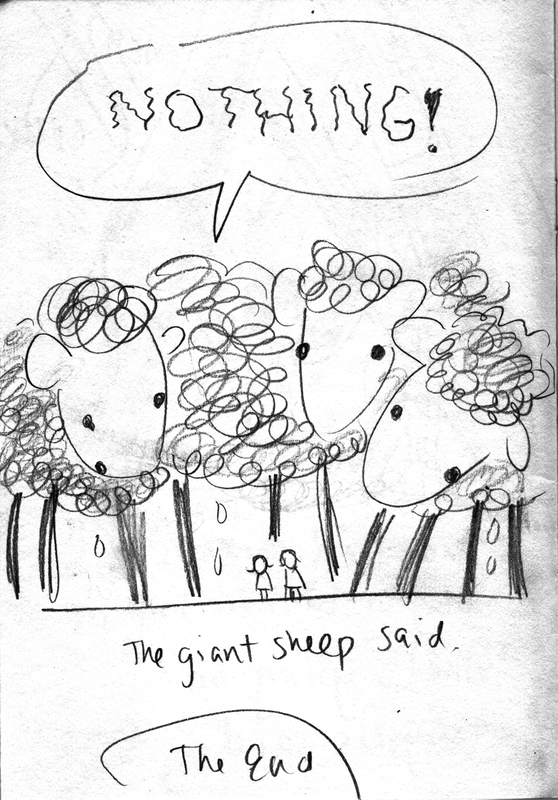 the giant sheep said. Heh heh! I told Mabel and Kathleen to draw the girls from far away. When I added the sheep they were SO surprised!